Matching Dragoons: Jonah Hex #47 "Doom Rides the Sundown Train!" 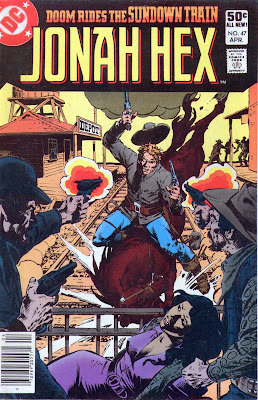 Jonah Hex #47 "Doom Rides the Sundown Train!" "Doom Rides the Sundown Train"
Some time has passed since we last saw the badly injured Jonah and his lovely bride of three weeks. They have bought the farm (no, they didn't die!) from last issue and Jonah is now up on the roof of the house making repairs. However, we see four men on horseback on a hill overlooking the farm and their intent is not to throw a shivaree. While Jonah is on the roof, gunfire suddenly erupts and Jonah takes a header off the roof. Jonah forces Ling into the house and runs around the back of the house to grab some dynamite that he has been using to remove stumps. Soon the four thugs see several sticks of lit dynamite arc up over the hill towards them and then they end up meeting their maker. When Jonah returns to the farm, Mei Ling says that she heard an explosion and wonders who the men were. Jonah states that it's too late to figure out who they were. Mei Ling is appalled that Jonah has killed four men that he didn't even know and she breaks down in tears. Turnbull interrupts Solomon and asks for a clarification about Mrs. Hex. Obviously, Turnbull has learned that Hex is not dead, as he last thought, and with this new information hatches a plan to make Jonah suffer as Turnbull has suffered. Several days later, Mei Ling is in town when Mr. Wilkins, the telegraph operator at the train station, asks Ling to come into the station. Just then a man standing behind Wilkins pulls a gun and forces Ling into the station. Much later, night starts to fall and Jonah realizes that his wife isn't home so he saddles up and heads into town. At the station, the thugs are anxiously awaiting nightfall so they can take Mei Ling to St. Joe and then keep moving her all around the country, out of Jonah's reach for the rest of his life. As the train pulls into the station, one of the thugs notices that Wilkins has been fiddling with the telegraph wires and they wonder if he might have sent a message. Suddenly Wilkins bolts for the door and they unload several rounds into his back, driving him out the window in the front door. Jonah arrives in town as a man runs up saying that Wilkins has been murdered. 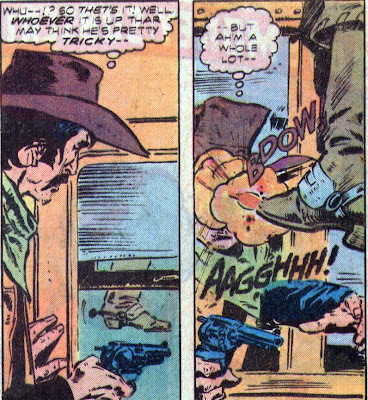 Just then the Sheriff confronts the villains and he is quickly gunned down. Hex saunters up and the thugs hold a pistol to Ling's head and then they steal the train. Jonah makes a last minute lunge to catch the train and ends up getting pistol whipped. On the locomotive, the gang kills the fireman and throws him off. One of them stays in the engine and the other two go back into the train. Back in town, Jonah comes to and heads off to intercept the train. Jonah finally catches up to the train when it stops to take on water and he leaps onto the roof of one of the cars. That actually made me chuckle. Jonah then heads towards the locomotive and beats the crap outta the thug up there and then heads back to the caboose after the engineer tells Jonah that's where the ringleader has taken Mei Ling. Jonah busts in on the ringleader (just as he is getting ready to take advantage of Mei Ling) and gives him an entire boot-to-the-head whoop-up. 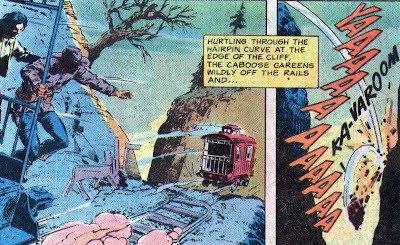 Jonah and Ling head out of the caboose but the villain is still conscious and puts a bullet into Jonah's shoulder. Jonah pushes Mei Ling into the next car and then pulls the pin between the train and the caboose. We get a two-panel showing that Quentin Turnbull learns that his thugs have failed. The rest of the issue is another Scalphunter backup. Timeline - This one covers several days between the dynamite killing and the kidnapping. It is unknown how much time has elapsed since last issue, but Jonah's back is better, so I'm guessing about a week. I enjoyed this story, mainly because of the boot stunt and the introduction of Turnbull into Jonah's marriage. The sad part is that Jonah doesn't know that these guys are hired by Turnbull and just thinks it's random goons looking to punch up their rep. 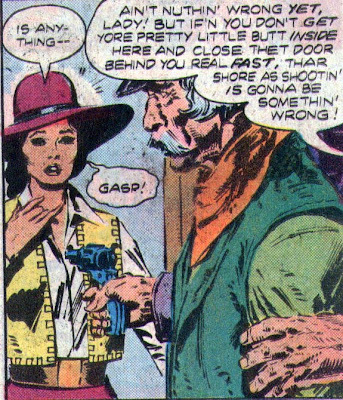 Even though I enjoy Scalphunter, I think the Jonah Hex stories suffered from the shorter page count. But, I always try to keep my readers happy, so here are a few quick scans from the Scalphunter backup. Yup, Indians in loincloths. Next Issue: An old friend of Jonah's shows up for dinner and goes stark raving crazy!! "...Mei Ling is appalled that Jonah has killed four men that he didn't even know..."
She really has no idea who she has married, does she? Jonah has made a CAREER out of killing men that he doesn't even know. Oh, and the gun in the boot was excellent. As was your use of "shivaree". There are times I think Jonah would have ended up killing men he didn't know even if it wasn't a career. When my Lovely Wife married me, she was unaware of hillbilly customs (such as the shivaree). Her aunts gave her a can good shower. My friends helped us move and took all the labels off the cans. I know that it wasn't a full blown shivaree, but it was the best I got. So there are some villains in the super-hero universe with trains for transportation. Are there anymore train stories in Jonah Hex? Booyah, there are several Hex stories with trains. I would start by checking the WWT stories in the sidebar. I'll see if I can tag them for ya, but it will probably take a week.